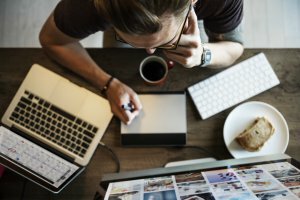 What type of insurance is right for my business? What type of insurance is right for my small business? Running your own business presents some great opportunities. It also comes with risks. Protecting it should be high on your list of priorities. So, insurance is a must-have, no matter what industry you’re in. But choosing the right insurance policies for your business can be time-consuming. And confusing. To help you, here’s a run-down of various products, what they cover. And why your business might need them. General liability insurance covers claims made against your business if someone’s injured, or their property’s damaged. It also protects your firm from personal injury claims. It’s the kind of coverage your business needs if your clients visit you. Whether you’re a freelancer working from home, or a florist with a store in town, if customers come to you, general liability insurance is a must. And if you do business at a client’s premises, you also need general liability insurance. Why? Because accidents happen. And without the right cover, if a claim’s made against your business for damage to a person, or their property, you’ll have to find the cash for legal fees and compensation, if you’re found liable. You run a cleaning business. A distressed employee calls saying they’ve knocked over a bottle of cleaning fluid all over your client’s expensive rug. It’s ruined. Your client expects you to pay for the damage. You run a lawn-care business. Mowing a customer’s front yard, your mower throws up a rock smashing a window. Your client wants their window replaced. You’re a freelance graphic designer. Your client comes to your home office to check out some new logos you’ve designed for them. He trips on some uneven flooring breaking his ankle and sues you for his medical bills. You’re a management consultant. After a heated email exchange with a client you take to social media to vent your frustration. The things you say about the client are defamatory, unkind, and untrue. Someone shares your post with the client. Who sues you for slander. Errors and omissions (E&O) insurance, also known as professional liability insurance, protects your business against negligence claims. It’s vital if you run a business offering a professional service. And as risk varies from business to business – architects face very different risks to IT consultants, for example – you can get coverage tailored to your particular industry. Because this type of insurance pays for your legal defense and damages, if a client claims you’ve made a mistake which has cost them, you’re protected. Even if you did nothing wrong. You’re an architect who’s drawn up plans for a knockout pool house for a client. The construction’s underway when you get a call from the homeowner. They’re upset that a fence has been removed in order to lay the foundations. Was this an error on your part because your plans weren’t clear enough? Or, an omission – you didn’t actually say the fence should stay. Or maybe, it was neither, and the fence didn’t need to be removed at all. As an advertising executive, a client asks you to come up with a campaign that will really turn heads. You present a few examples, but they want to go with something wild. You go back to the drawing board and present the client with a rather risque campaign, which despite your reservations, they love. “Go for it”, they say. So you do. A week after launch, the client has a PR disaster on their hands. And guess who gets the blame. You. As an interior designer, you’re coming to the end of a project to refit a smart new restaurant. With six weeks to go till it opens, you think you’ve got plenty of time to order the tables and chairs. You’ve never had an issue with this supplier before, after all. Until now. You do everything in your power to get the furniture delivered on time, or find a suitable alternative. But fail. And the restaurant doesn’t open on its official launch date. Leaving you in hot water with the client. There are so many scenarios when errors and omissions insurance can protect your business. Whether it’s you or someone else who’s dropped the ball. Directors’ and officers’ insurance is there to protect both for profit, and non-profit organizations. As a board member you’re responsible for making sure the firm’s run morally and responsibly. Which means if something goes wrong, the buck stops with you. Without insurance to take care of the legal expenses and damages, if a claim’s made for wrong-doing and you’re liable, it’s your wallet that’ll take the hit. You’re personal assets could even be at risk. Directors’ and officers’ insurance can cover your legal fees and any damages, if necessary. A fundraising event for a charity that you’re on the board of, is hosted at a local casino. It’s a huge success. But soon after, a complaint’s made about how much the event cost. And the way donations have been spent is questioned. An employee has a near miss at work when a pallet of glass tips over, only just missing him. He reports this to the board, but no action is taken. When a safety consultant inspects the building a few weeks later, he finds several pieces of equipment unsafe, key regulations not being followed, and training documents missing. If you’re worried you may not have enough cover, umbrella insurance is what you want. It acts as extra liability insurance. So if a claim’s made which goes over the current limits on your primary insurance, it takes care of the extra. Without it, you’d have to find cash yourself. Still not sure what kind of insurance you need? General liability insurance is crucial if clients come to you, or you go to them. It protects your business from claims for personal injury, bodily injury or property damage. Errors and omissions insurance is what you need if you offer a professional service. But it’s also useful coverage for other kinds of service-led businesses. For example, if you’re a decorator and a client claims the shade of paint you’ve just used to redecorate their entire office isn’t what was originally speicifed, E&O can help you out. Professional liability is another name for errors and omissions insurance. It covers mistakes you or your employees make. Director’s and officer’s insurance only covers people who are on the board of your organization. Not your employees. This isn’t really a one vs the other scenario here. You can’t buy umbrella insurance on its own. It’s something to get on top of your existing primary liability policy. If you think your limit isn’t going to be enough. It gives you extra peace of mind. As a general rule, there’s no, one-size-fits-all when it comes to business insurance. Do check your home state’s laws, though. And make sure you’ve got the coverage required. If you still need help, get in touch with one of the experts at InsuranceBee today. Or get a quote online. In minutes. This entry was posted in Directors' and Officers', Errors and Omissions, General liability, Small business insurance and tagged errors and omissions insurance, general liability insurance, help with Insurance, professional liability insurance, questions about insurance. Bookmark the permalink.